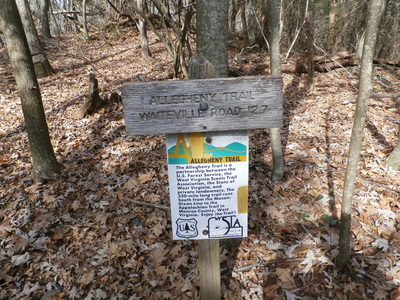 The Peters Mountain Wilderness is located in western Giles County on the southern slope of Peters Mountain. It was established in 1984 and expanded to 4531 acres in 2009. Peters Mountain, straddling the Virginia/West Virginia state line, is a long, rugged ridge running from the New River north, through Monroe County, West Virginia, and into Alleghany County, Virginia. The elevation of the wilderness area ranges from about 2000 feet near the southern boundary on Big Stony Creek to 3956 feet on the ridge just south of Pine Swamp Ridge. 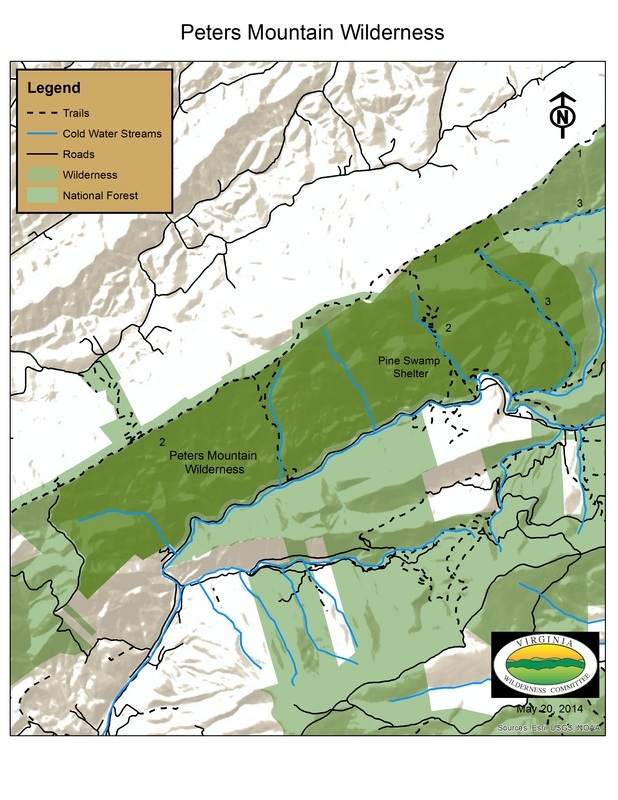 The southern boundary of Peters Mountain is mostly defined by Stony Creek, a beautiful trout stream flowing into the New River. Many small streams flow down the steep slopes into Stony Creek. Most of them are unnamed but the few that are give the impression of a wild, almost unwelcoming place, with names like Dismal Branch and Pine Swamp Branch. 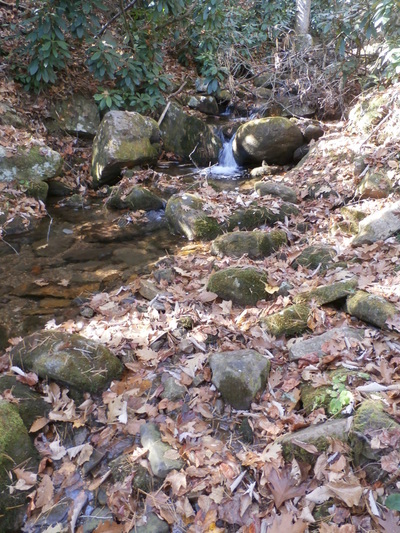 However, it should be noted that both of these small creeks are scenic, bubbling brooks. The northern boundary of Peters Mountain Wilderness is the ridge of the Peters Mountain. There are many finger ridges that descend the southern slope to Big Stony Creek. Some of the names are lost in history, like Mystery Ridge, which delineates the western boundary. Others like Huckleberry Ridge would suggest a feast of delicious berries, and in fact it is possible to find huckleberries on the ridge in summer. Pine Swamp Ridge dominates the central region of Peters Mountain Wilderness and defines the watershed between Pine Swamp Branch and Dismal Branch. Finally, there is Foster Knob, a mid-slope outlier with a good view down Stony Creek if one has the stamina to reach it. It is not an easy task. The ridge crest is interesting in several respects. It is capped with weather resistant sandstone, offering many rock outcrops, and the high saddle between Peters Mountain and Pine Swamp Ridge is a great place to explore. The canopy is dominated primarily by oak, hickory, maple hardwood forest. However, the springs and seeps in the saddle give rise to small stands of Hemlock and White Pine with an understory comprised of dense clumps of Rhododendron through which the Appalachian Trail winds its way. There are only a few trails in the Peters Mountain Wilderness. 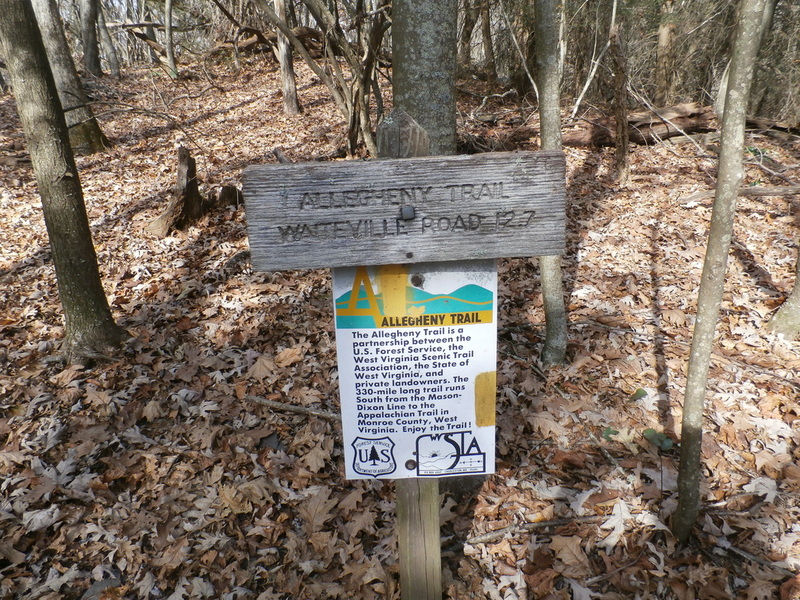 1) The southern terminus of the Allegheny Mountain Trail begins on the crest of Peters Mountain. This trail winds its way northward 330 miles to the Mason-Dixon Line. 2) Approximately 10 miles of the AT either borders the Peters Mountain Wilderness or passes through it. 3) A portion of the 8.8 mile Flat Peter Loop Trail crosses into the western end of the wilderness.